Review posted August 14, 2014. Alfred A. Knopf, New York, 2014. 228 pages. 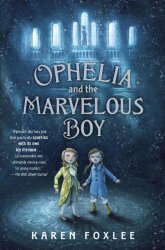 Ophelia and the Marvelous Boy is a marvelous book indeed. It begins with a prologue where the Snow Queen has the Marvelous Boy shut into a room. She tells him that when the charm wears off that prevents her from hurting him, she will harm him greatly. But the boy whispers that he will find the sword and the one who will wield it. Ophelia did not consider herself brave. She wasn’t like Lucy Coutts, the head girl in her grade, who once rescued a baby in a runaway stroller and was on the front page of all the papers. Lucy Coutts had heavy brown hair and pink cheeks, and she called Ophelia Scrap, which made everyone laugh, even Ophelia, to show she didn’t mind. Ophelia didn’t consider herself brave, but she was very curious. She was exactly the kind of girl who couldn’t walk past a golden keyhole without looking inside. Ophelia is in a large museum in a city far from home, where her father, an expert on swords, is preparing an exhibit. He brought Ophelia and her sister Alice along, hoping it would help them recover after the recent death of their mother. But Alice doesn’t want to do anything but sit in her room with headphones on, so Ophelia explores the museum and sees the keyhole. On the other side of the keyhole, an eye is looking back at her. The boy whose eye it is tells her he comes in friendship and means her no harm. But when he starts telling her his story, the things he says are unbelievable. Ophelia is a member of the Children’s Science Society of Greater London, and she doesn’t believe in magic or wizards or enchantments. But the boy (who says the wizards took his name for his safety) asks Ophelia for help. He needs her to find the key to the door. To do that, he sends her to the 7th floor of the museum, where the Misery Birds are waiting. And then the key doesn’t even fit the door! The boy sends Ophelia on a total of three perilous quests before she can get him out. And meanwhile, time is running out and the sinister museum curator seems suspicious, and what’s going to happen to Alice? Of course she couldn’t save the world. She was only eleven years old and rather small for her age, and also she had knock-knees. Dr. Singh told her mother she would probably grow out of them, especially if she wore medical shoes, but that wasn’t the point. She had very bad asthma as well, made worse by cold weather and running and bad scares. Ophelia thought this should have all been proof that she couldn’t possibly help. My only quibbles about the book involved world-building. It seems to be our world, since Ophelia lives in London. There is an exhibit on Napoleonic Wars in the museum, and another of a Quaker kitchen, and other exhibits that could only happen on our world. But where on our world, even three hundred years ago, is a land ruled by wizards, or a kingdom where a Snow Queen could get away with making it snow for centuries? And where do Herald Trees or Misery Birds grow? And what year is it supposed to be? Ophelia wears glasses, they fly on an airplane, and people wear jeans and T-shirts, but why are no cellphones mentioned? I would have had no troubles with the story if it takes place in a different world. But in our world? I’m having a little trouble believing in the magic. Though in some ways, that makes it better, because I share Ophelia’s skepticism. And we totally agree that no adults will believe her. I’m sure children won’t be troubled by these details, and the location of the Snow Queen’s country is left mysterious. But all in all, this is a wonderful, child-sized adventure. Let’s hear it for ordinary, asthmatic, curious children who manage to save the world.